To those who have commented on my last 3 blogs. It's great to know that I'm not alone, and I sensed no judgment whatsoever from anyone, just understanding and suggestions that may help and acceptance. Thank you all. Came across this quote by John Green and it's so true. I don't really have any "fleshy" friends that I am open with. I've tried, and every time I just feel judged, belittled, or just completely unaccepted. Thank you for just letting me be me. that last part, "pull us out of the prisons of ourselves," is so accurate. Ha..ha...I always used the term fleshy friends until someone told me they thought I was being mean implying that they were fat. I guess you can be misunderstood even in spark world from time to time. I don't share my personal biz anymore with my fleshy friends either...I always overshared thinking they were like family since I've known most of them over 25 years. WHAT a mistake that was. Now all of that personal background info is used against me...ugh...where did empathy and understanding go in this me...me...ME focused world? At least we all have each other and that is a blessing supreme! Sending you all the love in the world, beauty! I feel the same way about "fleshy friends". You are a real sweetheart and only wish we lived closer so that we'd be able to hang out together. I am closer to my SparkFriends than any "fleshy friends". I hope someday we'll be able to meet in person. I'll always do my best to be her for you! Sweetie, you are one of the truest friends I have. Love you and will always try to be here for you. 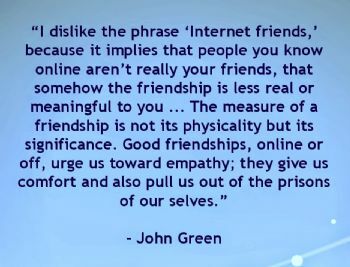 "Internet friends" seems like a very different relationship than "fleshy friends" (like that phrase! ), but no less real. It can even be a deeper relationship. Thanks for sharing. I have also never felt judged here.